On Saturday, June 5, 2010 the Endeavour Institute which sponsors local Endeavour Academies at Paso Robles High School and Orcutt Academy, hosted a STEM Education (Science, Technology, Engineering and Math) oriented Balloon Fest at Tobin James Cellars. Eighty Endeavour students gathered in the Tobin James vineyard to test their hypothesis regarding various aspects of atmospheric pressure. The students were free to choose their own experiments, design their gondolas and choose the equipment they thought they needed to gather the information which would prove or disprove their hypotheses. 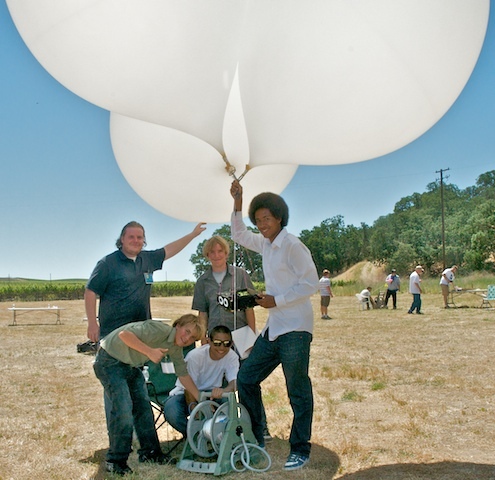 Students filled tethered experimental balloons with helium which would support their gondolas, launched them and kept them in the air to gather their data. Mentors for each team were present to discuss solutions for problems which were encountered during the hour or so the balloons were in the air. When they had gathered their data, the teams met with their mentors to analyze the data, and prepare a Power Point Presentation in which they would present their conclusions to the audience. The audience was made up of students’ peers, mentors, parents and scientists from across the state. As the Endeavour Instructors pointed out, student experiments are successful as long as the students have recognized that an experiment must either prove or disprove their hypothesis. This focus is a central tenet of STEM education which emphasizes that the ability to use critical thinking and problem solving is more important than getting a predetermined correct answer.